First i thought i'd just post this after the 2 channel version to the same post - but the permalink to that post is "2-channel-mixer". So. Sorry for "double" post, but here's one for NoNE. This is an interesting one! I think I'll give it a go. Is the diode a 1N4001? Hi Travis. I think it is polarity protection as goes straight from +9V. I've forgot to mention that.. Sorry. Yes. 1N4001 or 1N5817 will do fine. Hello. 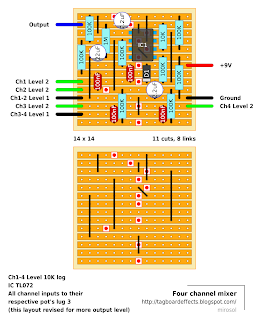 I`ve buili this circuit, but it eats a lot of the gain when using it with clean signal. Any suggestion what have I`ve done wrong or is it supposet to be like that because of the buffer or something? That's probably due to Impedance mismatching between your guitar pickup and the input resistors in this design. It's designed for line level signals (~10k) whereas your guitar is slightly higher (~50k). Would the changes required for coping with higher impedance (guitar input) be major? Can anyone give some pointers on the changes required? Miro, just wanted to verify that the electro cap in the 3rd row is supposed to be 22uf not 2.2 uf like the other ones. never mind found the circuit online and verified. I should have posted earlier, I made this a while a go and it works fine you can mark as verified. Thanks! I'll tag it right away! mmm thank you very much Miro. And sorry if I didn't saw and thanks before. I was away for a while. Sorry Miro but I don't understand. C6 in the GGG schematic is 22u not 2u2 ? So do we have to solder 3 2u2 or 2 2u2 and a 22u ? Hi NoNE / Mirosol - Did you fine out if it was a 22u or 2u2 in that 3rd column? Now you got me confused.... The layout has one 22µ and two 2µ2 caps. C6, the vref voltage filter cap is 22µ (twenty-two micro farad). This is the cap that has its + side in touch with IC pins 3 and 5 and two 100K resistors. Power filter cap and output cap are both 2µ2. Perfect and very quiet circuit. Thanks again. Hi Miro, what type of switch could I use to make a channel mute function and where would I put it? DPDT on-on. Input to lug 2. 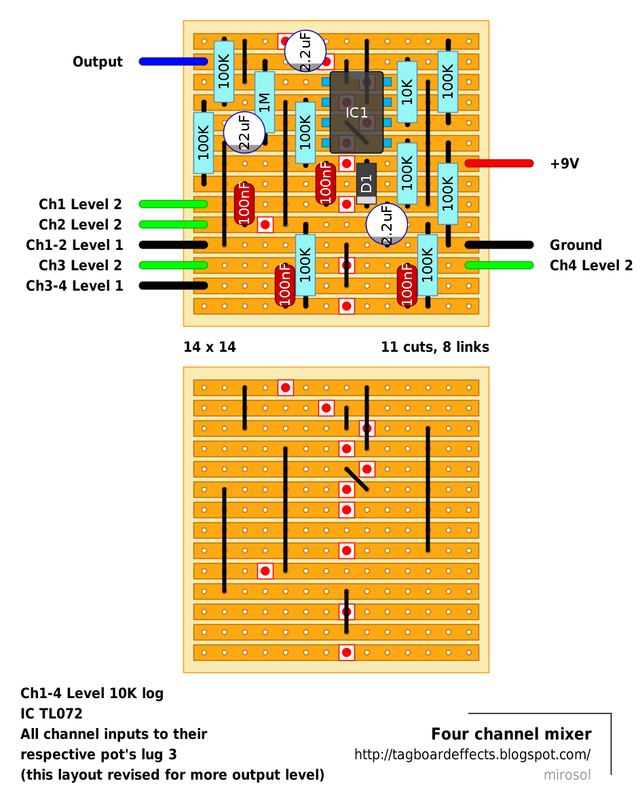 Channel level 3 to lug 5. Lugs 1 and 4 jumpered. Lugs 3 and 6 to ground. That way the input of the mixer channel is grounded as well as the source. So it's basically just a bypass switch with other position ground both ways. You could use 3PDT on-on to have LED in there.. Thanks Miro, can you help me throw in an LED with the DPDT? This would be a table-top mixer for my looping set up, and toggles are easier to quickly switch than pushbuttons. You'll want 3PDT, as it is good practice to ground the mute both ways. On 3PDT, just take ground to lug 8 and LED cathode to lug 7 - that way it'äs lit when the channel is open. I noticed a difference between this layout and the schedule of ggg. It's the 100 k resister on the right of the ic. On the ggg schedule it has a value of 10 k! (R10). Together with r13 (100k) it creates an amplification of 10. Here the amplification is 1! Is this the reason of the complaint of gain loss i read on this forum? You did this on purpose or is it a omission? All the resistors in the circuit are 100K, except for the output pulldown (1M) and the omitted LED resistor (8K2). Sure. One could try to tweak the output of the second half of the opamp by trying different values for R10 and R13. Nevertheless, the schematic has them all as 100K. First I want to say that I respect you very much and enjoy reading all those verolayouts with great interesse. I made allready the modded box of hall and it works great. Now I'm going to build the mixer. Great: it helps me through the Dutch winter. But you use the 2002 diagram of 2002. The recent 2013 diagram has a 10 K res. on R10. I could post revised version in addition to the original. So thanks! I had no clue there was a revised schematic up at ggg. It intrigues me why they altered the value for some amplification. O.k. it will create more "headroom" and no loss of gain. I will ask them and I let you know. Yes, you got the math right, it's a gain of 10. I did this so that the unity gain was approximately at straight up on the pointer of the mixer knobs. This is the way most mixers work. I tested it with a resistor "breakout box" and the 10k value was about right. Surprisingly (to me anyway) it would go down to 2k or so and still not distort the op amp. So if you're looking for even more boost in your mixer, you could probably set it down to 5k or so (if you are using guitar with passive pickups). I always experience a certain loss of signalstrenght when I connect several signals together in the passive way, like here.
" Since most mixers provide some boost, I thought this was the best setting for this mixer." So I think that the 100k to 10K swap can be a simple but valuable upgrade of this good and classic mixerdesign. I like the small size of the vero and the cost. just a couple of euro's. Added the revised version to the post. Thanks Hans for the footwork. By changing this resistor,is that possible to use this one as a low-z to hi-z converter ? What would it take to get a basic tone control on each of the inputs? 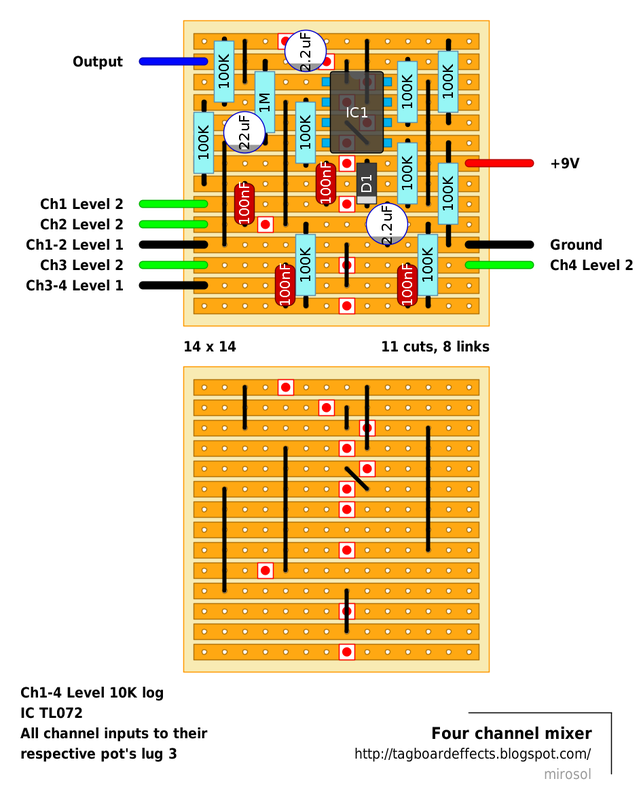 Would just slapping a BMP in front of each input work or would it require a buffer or booster circuit before that? I have the same question. Jerry - did you find a solution? Anyone have any ideas? Is there a way to make this stereo with pan knobs for each channel? i think the two channel wont let my stereo output from my phone or ipod goes stereo. i could be wrong, but two inputs would be two channels. both mixer layouts have mono output. it shouldn't matter if you're input is stereo, it should work fine. anytime buddy. hope it all turns out as you expect man. So, I've got a few questions about this mixer, if someone here would not mind answering. 1. Can I add a master volume by putting a pot on the output? 2. Can this mixer out run direct to a speaker or will it need an amp? 3. I only need three channels. Can I just not wire up the 4th channel? 2. The opamp wouldn't be able to ramp up the necessary current to drive a speaker. So a separate power amp would be required. Looks like another updated schematic 04/29/2016. C6 is now 2u2, C7 is now 22u. R10 now 82k. Hi, how would I reduce hiss? I experience it to be quite noisy... Any ways to help out that problem? Thanks!